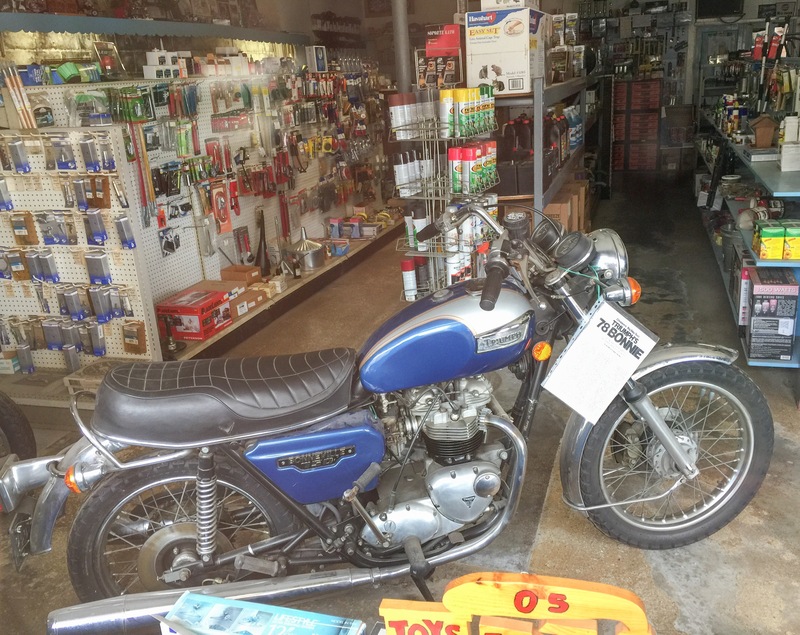 Moto Maestro – another window find in Michigan. Old flyer for the Hobart workshop. West Dunes Highway – one of the best stretches of the weekends trip is a section through the wooded back dune. The canopies arch overhead and there’s just enough bend in the road to keep your swooping motion fun. Century Art – today would have been the great Jack Kirby’s One Hundredth Birthday. A fluid line work always added a dynamism to his creations. 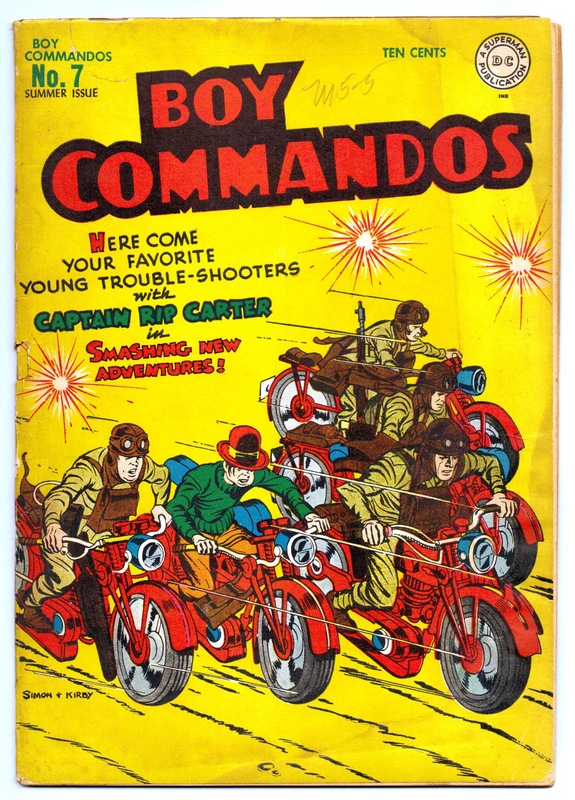 Known for Hulk, Thor, X-Men, and The Silver Surfer to name a few here is the cover of a collaboration with Joe Simon (Captain America) for Boy Commandos. One particular character ‘Brooklyn’ seems to be the adventurous rake with wool sweater and bowler hat. 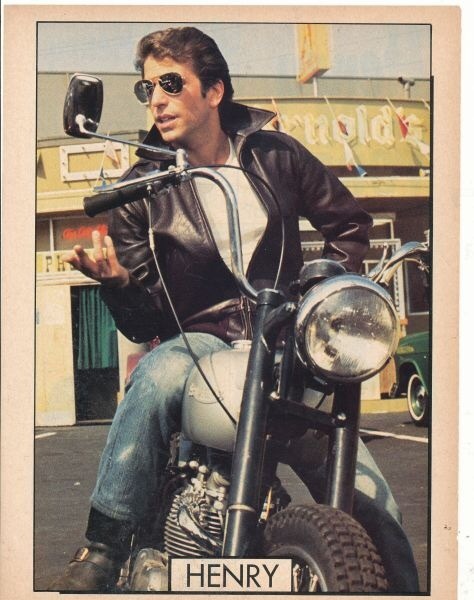 The red Harley lookalikes seem a bit garish but the energy is there! 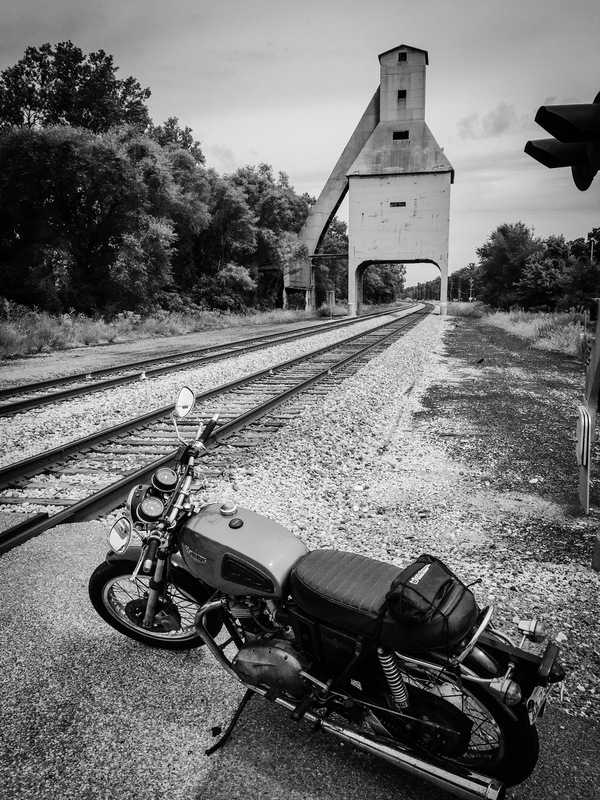 Coaling Tower – the ride today took us along Route 12 into Michigan. It runs parallel to various rail lines including the South Shore. This structure stands just outside of Michigan City and was used to refuel steam locomotives. 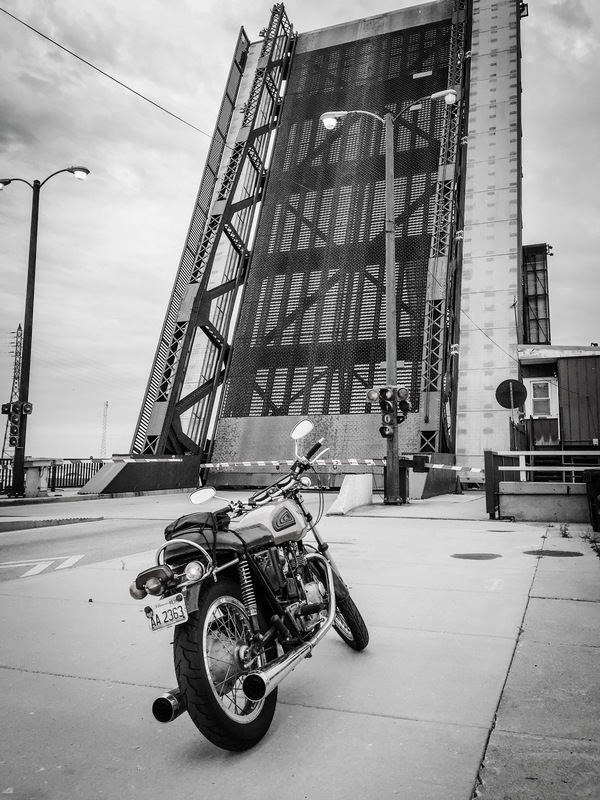 Calumet River span – another distinctive structure was the raised bridge over the Calumet. Great engineering. This was in its up position for maintenance. The detour took us over the 95th St Bridge; another bascule structure, which was used to dramatic effect in the Blues Brothers car chase. 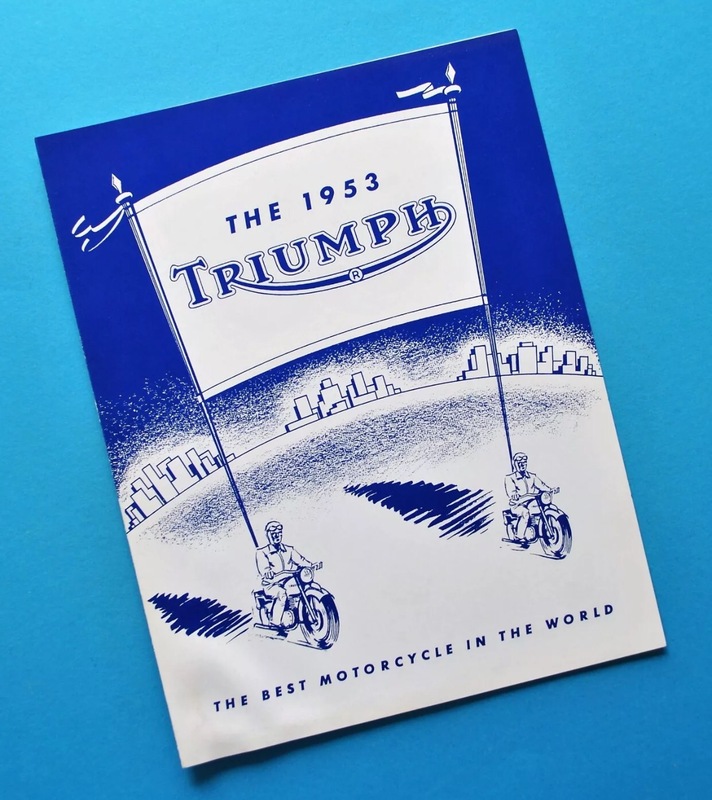 Banner – like some horse mounted knight of yore these Triumph riders carry the pennant of moto coat-of-arms. Badge – makers mark or manufactures marque. 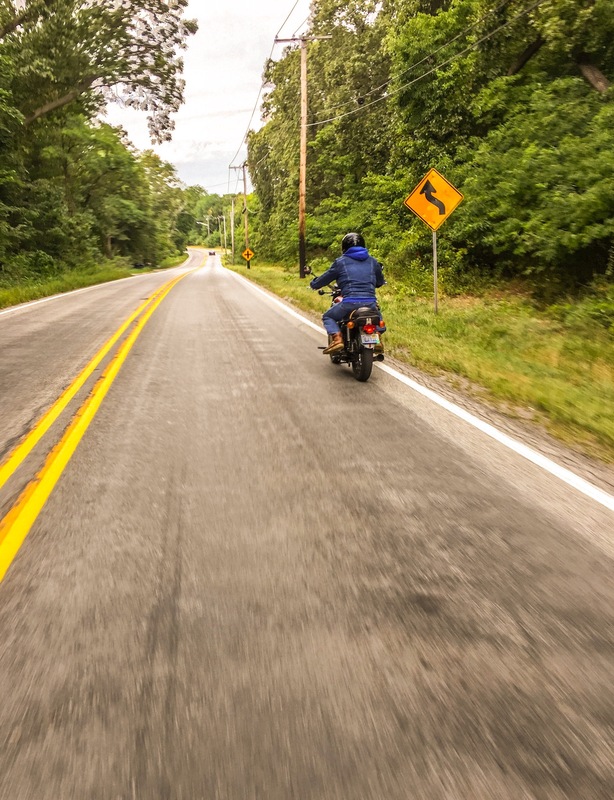 Recognition and Trademark are what give these motorcycle companies a dedicated following. Signage of the machine. 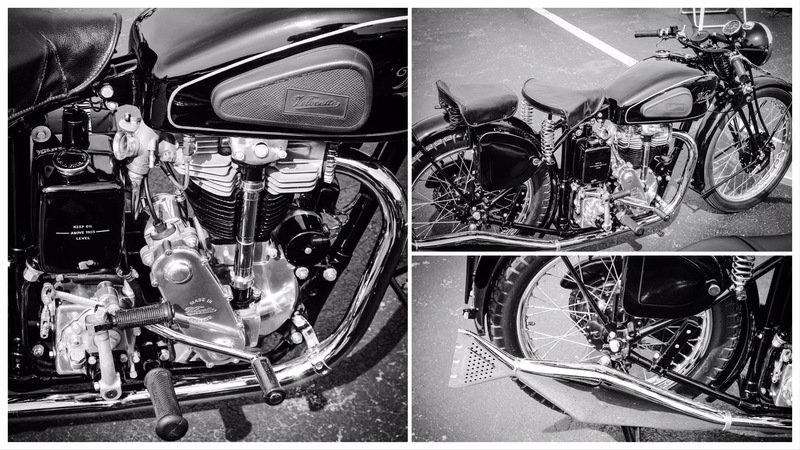 B&W – beautiful ’38 Velocette KSS. This single cylinder 350cc is vintage platinum best. Kam (Camshaft) Super Sport these saw racing success in the Twenties. 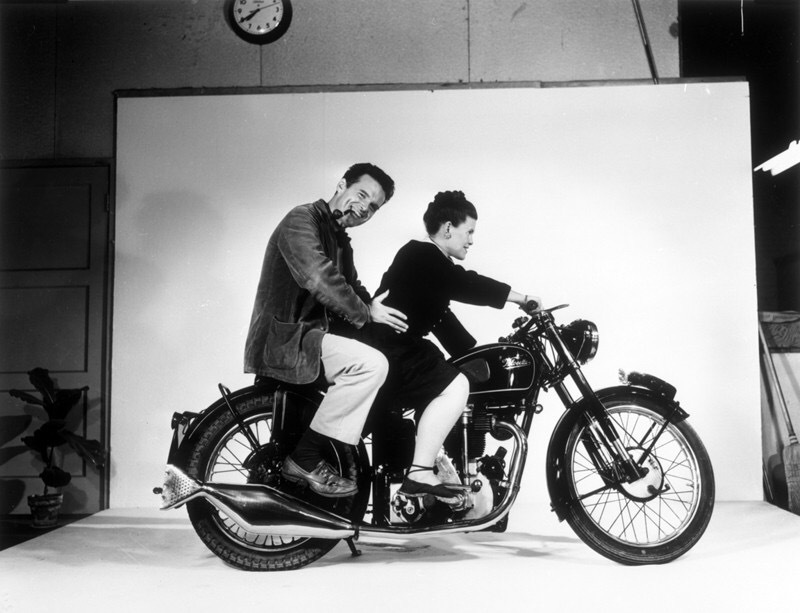 It’s the same model Charles & Ray Eames sat on in this wonderful portrait. Pumping Iron – each of these were forces to be reckoned with in their day. From the ’71 BSA Rocket Three which briefly had its moment in the spotlight before Honda’s CB750 turned up on the scene. Honda’s 450 Black Bomber heralded reliability in mechanics and electrics. The scaremongering H2 Mach IV 750 from Kawasaki to quote a contemporary Moto journalist “scarily fast, good-looking, no holds barred motorcycle”. 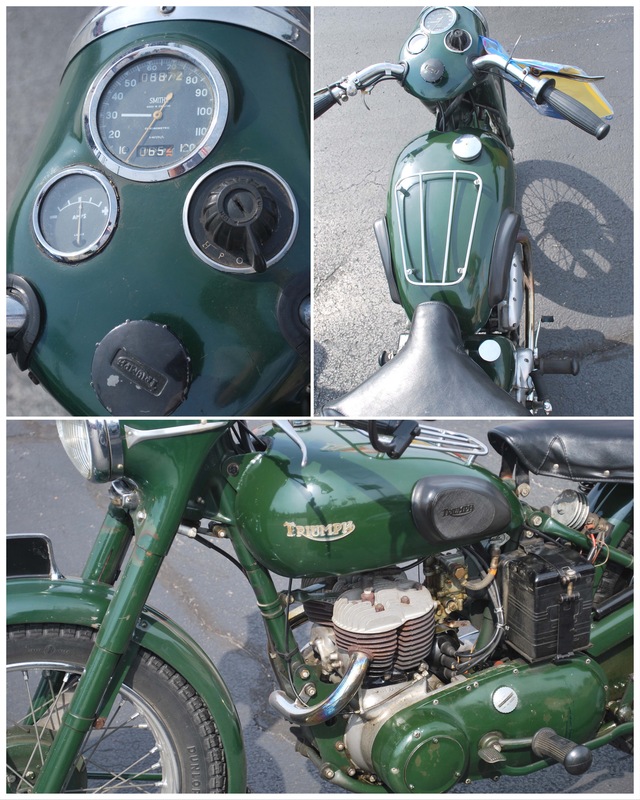 On Show – there was some superb vintage cycles on show yesterday; here’s a small selection: a forest green Triumph TRW. The military 500cc side-valve developed for multi-use tasks: courier, sidecar, MP. A smart item that’ll keep service like a Sam Browne belt holding a holstered Webley revolver. 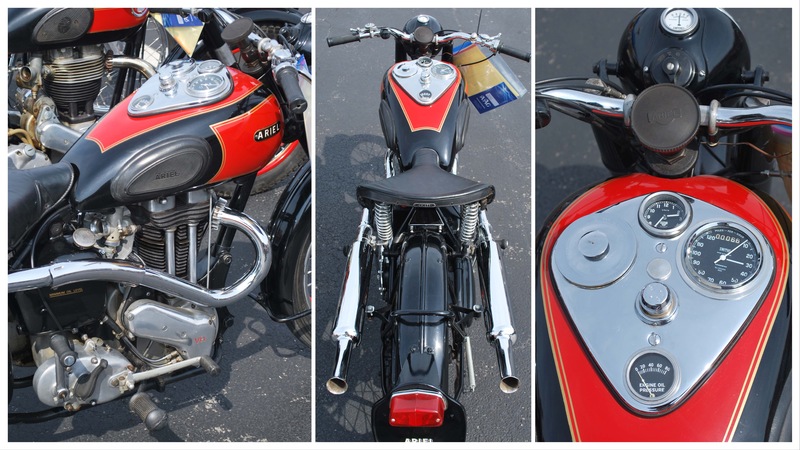 Orion’s Belt – This ’37 Ariel Red Hunter was parked up with a polished engine, gauge cluster, and high pipes. Tomato red tank accent and gold pin-stripe adds a splash of color. 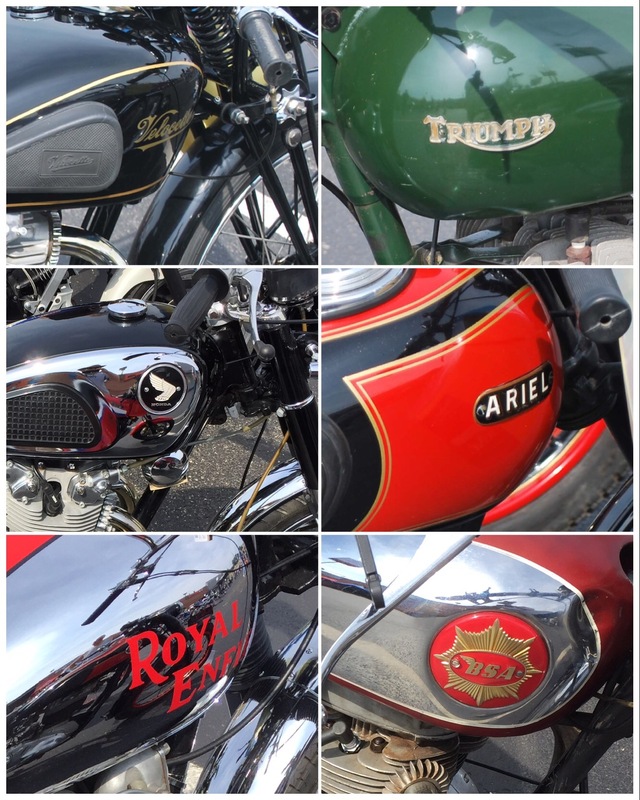 These were the sports bikes in the pre-war period. 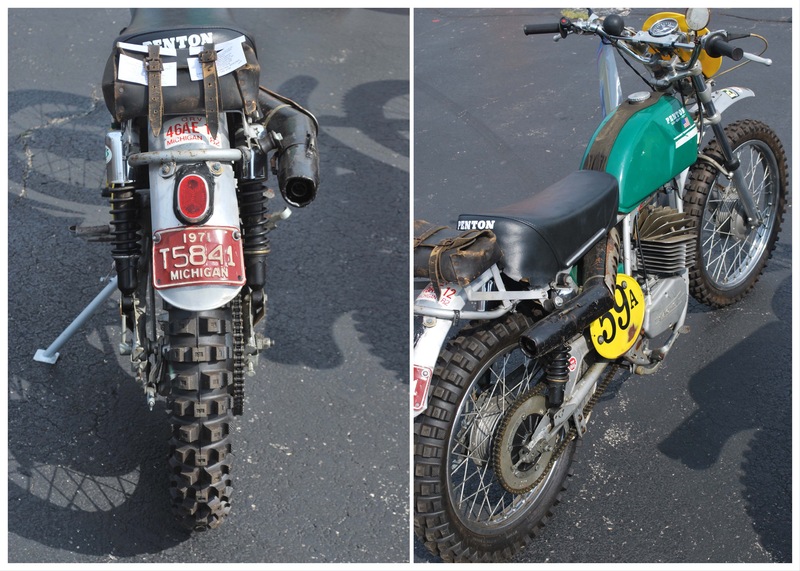 The Green Enduro – New knobbly off road tires behoove this ’68 Sachs powered Penton 125 Six-Days KTM built ‘crosser. Would be a good woods bike to hare through the forests of Michigan; which it looks like this one already does! 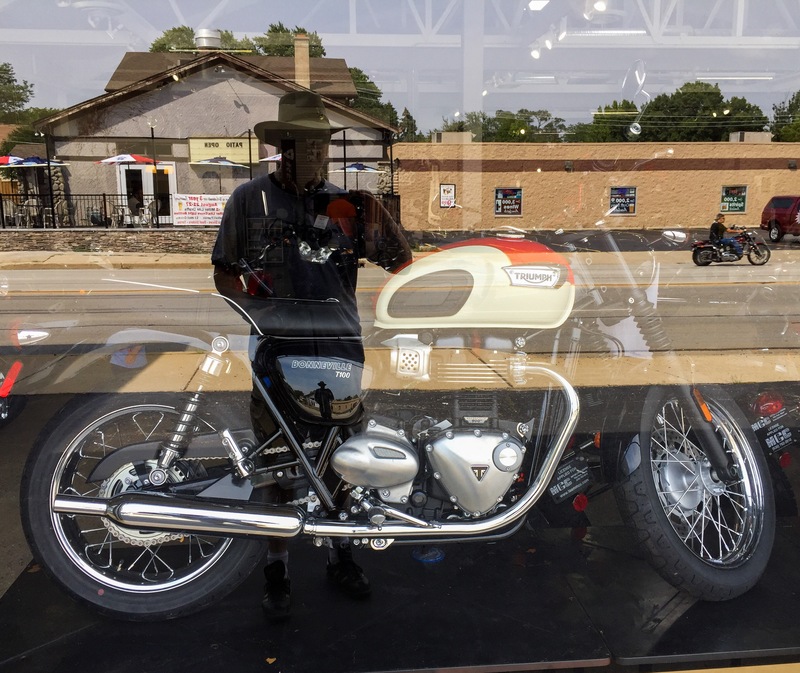 Window Shopping – I went to the Norton Owners of Chicago’s Vintage Motorcycle Show earlier today. 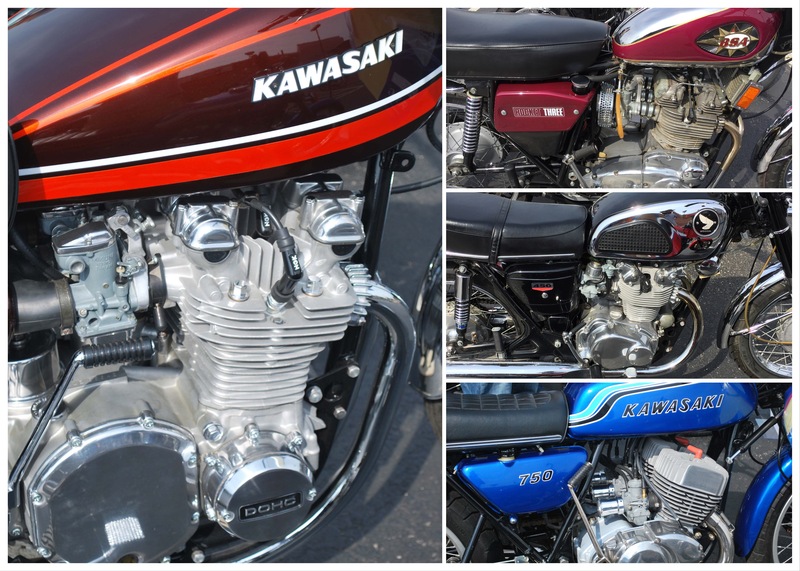 It was held in the parking lot at MCC in Villa Park – Triumph, Ducati & KTM dealer. 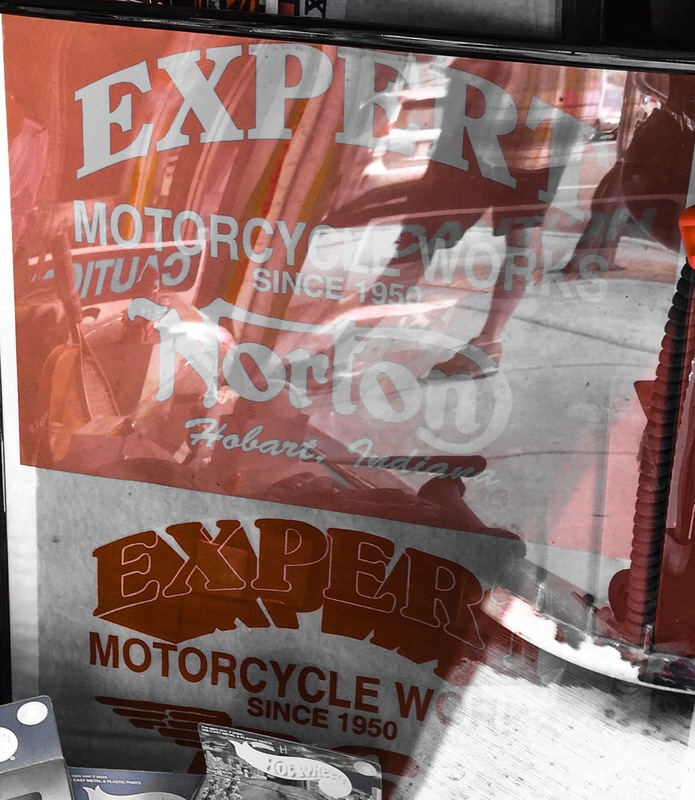 The blog posts next week will cover the exhibited offerings; but in the meanwhile I had a gander at the newer motorcycles neatly lined up in the showroom. 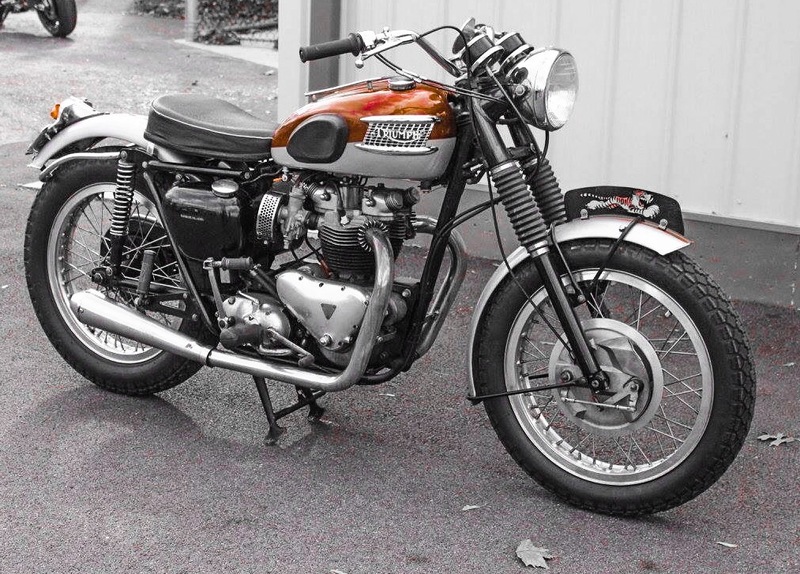 This is a T120R Bonneville.. quite splendid. 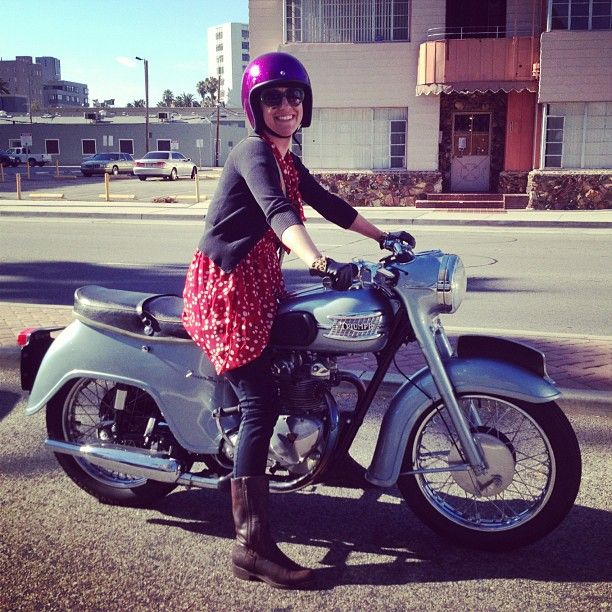 Grape – all smiles for this ’58 Twenty One owner/rider. The blue sky mirrors the sky blue bodywork. Bathtub rear skirt, valanced front fender, and nacelle headlight. In this condition they are as rare as hens teeth. Little 350cc engine still had heart. Cherry Pie – a year ago today we were enjoying Michigans best cherry pies in Beulah up near the Lelanau Peninsula. 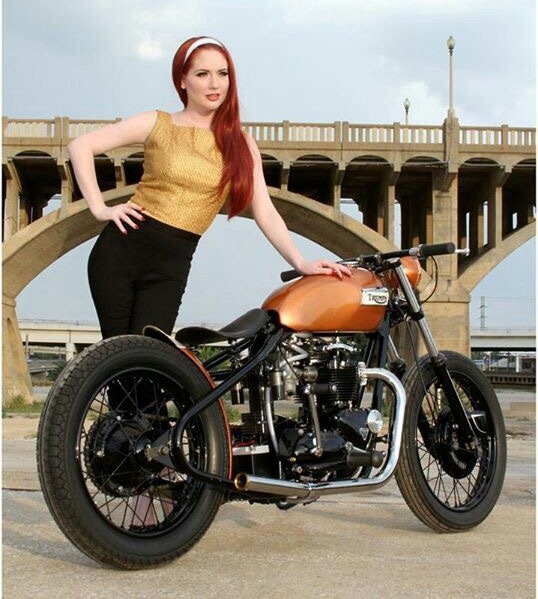 Well, this fine example of a pre-unit Triumph sure is a tasty treat wrapped in pastry, a la mode.